1. 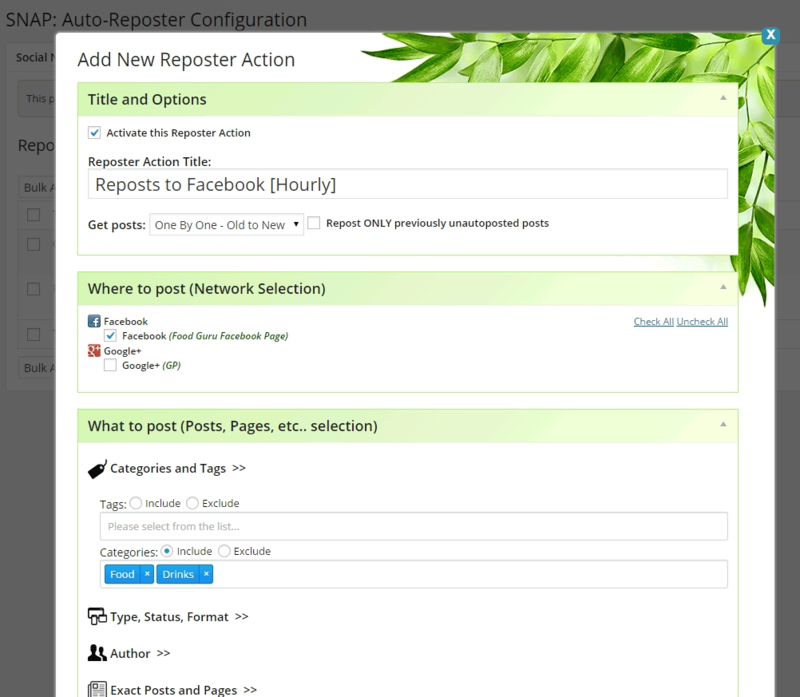 You can Activate/Deactivate the Reposter and set ho to get your posts – One-by-one or Randomly. 2. You can choose what networks this Reposter should post to. 3. You can set how often to posts as well as what time it should start and stop. 4. 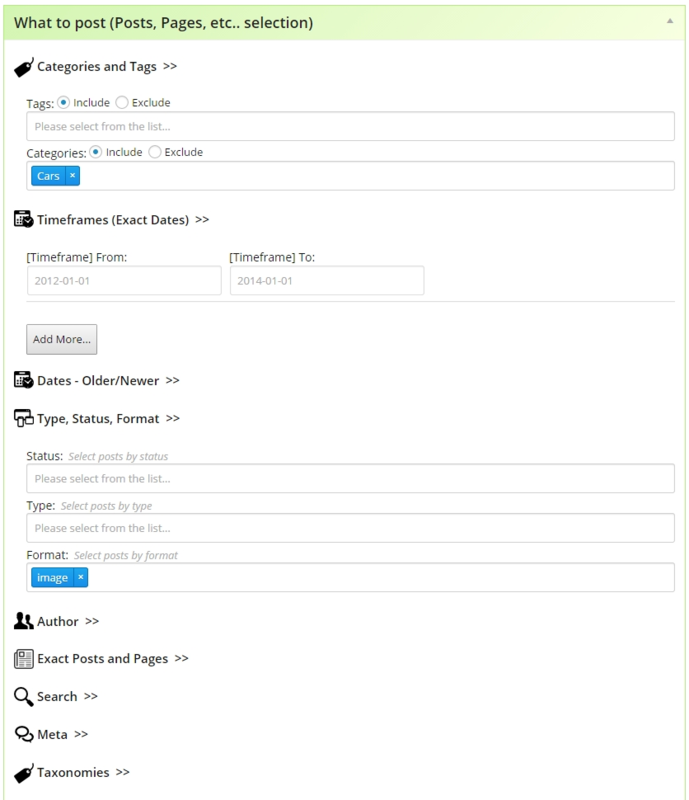 You can define what posts, pages or other custom post types will be posted. UPD (Jan 18, 2015): Please do not ask for a release date. We don’t have any specific release date set yet. As soon as we make a decision on a date we will publish it right away. SNAP V4 is not just some improvements, it’s almost 100% rewritten. We need to make sure it’s done right. All we can say right now, that beta version should come out in several weeks, and final release date will depend on beta testing. Beta testing will be public and we will announce availability of the beta release here in this blog and of course it will be autoposted to all our social accounts. So follow us anywhere you like. Do you have a date for release of Version 4? Please see the update in the post. Yes, when will you be releasing? Repost Actions sounds like a GREAT solution for this. A yes it's christmas. Keep forgetting. Looking forward myself. Different social media have different times when it is best to post. In addition, I'm in Asia and those times in Europe and the US are rather impractical for me, so I end up posting way earlier than I should. sounds great. will it be possible to choose different selection-criteria at the same time like "exclude category xy" but at the same time "include Tag XY"? I'm looking forward to the release - when will it be? When V4 will be released? This functionality is not yet released. How could it be "not working"? Sounds Great! Is it like about post old posts? And one thing I wish for in the future, Post to own Micro sites, own hosted. How is this related to the upcoming V4 reposting? Will LiveJournal continue to be supported, including this enhanced functionality, in V4? Please can you let myself and others who have asked "When is the release date" for v4? Will v4 be a free upgrade to v3.4.9? Yes, all upgrades are always free. Will there be an option to stop auto-posting a blog post after a specific number of times re-auto posted? This would come in handy, since someone ma not want the same post from a year ago being re-posted after a while. A specific number of times MAX that a post will be reposted would be helpful, or (I do see that you have a date range setting), since you already have functionality for specific date ranges, perhaps you could add a field for "Only Auto-Repost Posts that are X Days Old" that way if it is a post from 3 months ago, it will stop being auto-reposted. Thanks for the reply, I did notice this actually all ready in the old version (post between X and Y days old) after my post. I had another question, I just saw something interesting on someone else's twitter page, is there (or will there be) support for Twitter Cards? Thank you Ludwig for all your efforts on this invaluable upgrade. something new about the Beta-Test? When is this coming. Do you need beta-tester on live website?I would definately want to try this. Question: the new plugin (version 4) will be heavier? It will be possible to insert multiple photos in the same status? Feature Request: Repost will choose a random old post (and not follow a sequece). This feature already exists in V3, but it's available only in the "Pro" version. Can we test the beta version? Is it possible to auto re-post to mulitple facebook pages? Example: set random re-posting of posts under tag "A" to facebook fanpage "1" then a different one to fanpage "2", "3", ect... all different and random posts from a large post library? Yes, this will be possible. can I set different settings for each different posts? in my case, i have to promote events, so, i have different exparation event date for every different post. the "one rule for all" is not working for my needs. for an example, lets say i have an event in 10 days from now. i want to promote this event for the 3 first days one time a day and for the last 2 days I want to autopost every 6 hours. Some other evets are in 3 days from the posting date. i just bought the pro version and i haven't see an option like this, so, it is very important to know if in the upcoming version i can set the autopost for every post, not to set only one rule. Yes, this is one of the main reasons why we are re-doing it. V3 can't do that. V4 will be able to do that. Will it be possible to style Facebook posts differently based on category or post type? Like full text on one type and the default on another? Yes, it will be possible. Actually styling Facebook posts differently based on category is already possible in the current version 3.x.x. "Post type" and many other filters are coming in V4. I've looked and can't find out how to do this. Can you point me in the right direction? P.S. Just upgraded to PRO. we can get the SNAp v4 beta ? and wen you release it ?